I hope you had a wonderful Easter with family and friends. I just couldn’t resist posting this sandwich – it’s one of my favorites . . . and you have to do something with all those pretty little eggs in your frig! What a perfect week to enjoy this classic sandwich. 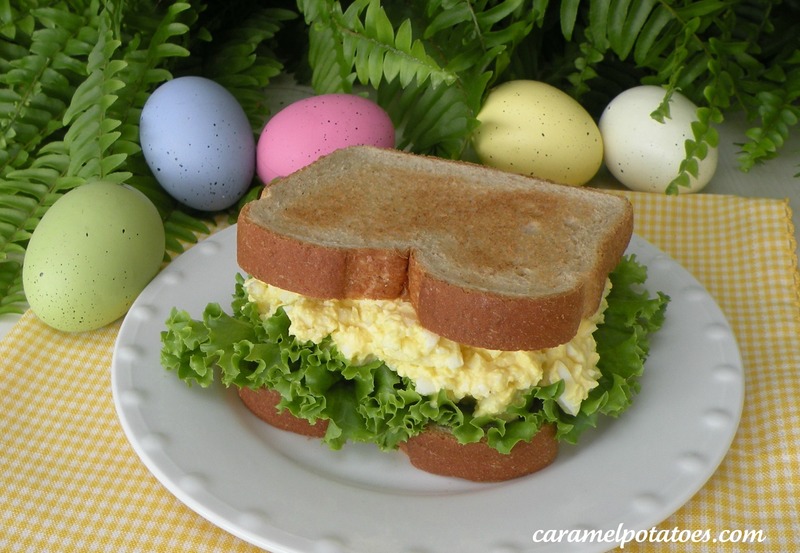 This recipe is for a simple, basic egg salad sandwich. I love it just like this. However, you can customize it just about any way you like with green onions, celery, or pickle relish (I prefer dill relish, but either will do). I also have some friends who like to spice up their egg salad with tabasco sauce or Cajun seasoning. However you like it, you’ve got a great lunch this week! In a bowl, finely chop (or just mash with a fork), your eggs. Add mayo, mustard, sugar and pepper! Spread on bread or toast, add a little lettuce and enjoy! Makes one egg salad sandwich. Looks pretty yummy to me! I put a little celery salt in my egg salad. We are having this for lunch tomorrow!